Sorry, no cartoon today. And I guess I'm a little late with my rant. 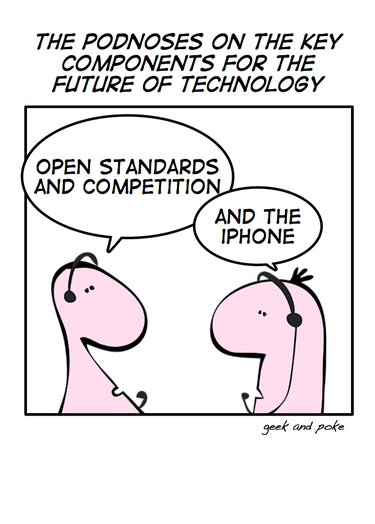 But it bugs me, that Apple ensures an iPhone monopoly in every nation by letting just one provider sell it. And the provider can charge ridiculous prices for the plans. E.g. here in Germany you can normally get every phone with every provider. That ensures competition. But not with the iPhone. You have to buy it with the T-Mobile plan, which charges you at least 49 Euro for unlimited data. And T-Mobile cripples the bandwith to 64kBit download / 16kBit upload after 300MB of downloaded data . Why do I need 3G when it's crippled to ISDN pace? Thank you Apple for bringing us the monopoly back!